Telling a visual story, planning out the narrative, storyboarding, interviewing, editing – making a documentary film involves a lot of useful skills for the modern age. 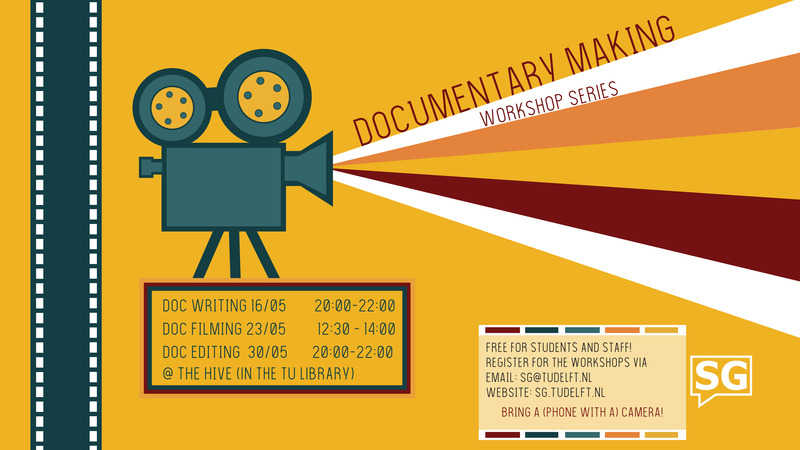 This workshop series, under the enthusiastic tutelage of alum Maarten van Vliet, will guide you through the basic steps in developing your own short doc. What you can expect: you’ll be working in small groups to write a doc, film it, and edit it. You can use the most basic tools at your disposal – a pencil, paper, your smartphone, and some free editing software – or, if you have access to something better, bring that along instead. Depending on the time you put into it yourself and the complexity of your topic, your final result may be a documentary of about 3 or 4 minutes in length. The topic of the doc is entirely up to you and your group, although we will be providing some examples for those who need them. The resulting films will be screened for the group and may be promoted online as well if participants agree. The best documentary (as voted by all participants) will receive a prize, namely a budget to continue the documentary filming at greater length and with greater production value. Registration is limited, so sign up quick! When you sign up note that this is a series and attendance at all three sessions is required. For the evening sessions we’ll provide some free drinks and snacks, and a lunch for the daytime (filming) session.